Photos by Robert Divers Herrick. Attention! We’ve moved highlights the ongoing displacement of artists and cultural spaces by bringing audiences to a floating, itinerant version of an underground club. Created by artist Constance Hockaday, Attention! We’ve moved. will be cruising the San Francisco Bay from January 12–14 and launching from Pier 40. With Dynasty Handbag, Las Sucias, MSHR, Voicehandler, Kevin Blechdom, and a psychedelic dance party by International Freakout A Go-Go. With Dynasty Handbag, Las Sucias, MSHR, and International Freakout a Go-Go. With Dynasty Handbag, Voicehandler, Kevin Blechdom, and International Freakout a Go-Go. Jibz Cameron is a performance/video artist and actor living in Los Angeles. Her work as alter ego Dynasty Handbag has been presented at international dives both great and small. She has been heralded by the New York Times as “the funniest and most pitch perfect performance seen in years” and “outrageously smart, grotesque and innovative” by The New Yorker. She has produced numerous video works and 2 albums of original music. In addition to her work as Dynasty Handbag she has also been seen acting in work by various avant-garde theater groups and in many comedic web series that remain unpopular. She also works as a professor and lecturer of performance and comedy related subjects at Cal-Arts, among others. Jibz recently moved from New York to Los Angeles and is in development with Electric Dynamite on a television series about a performance artist that moves from New York to Los Angeles. 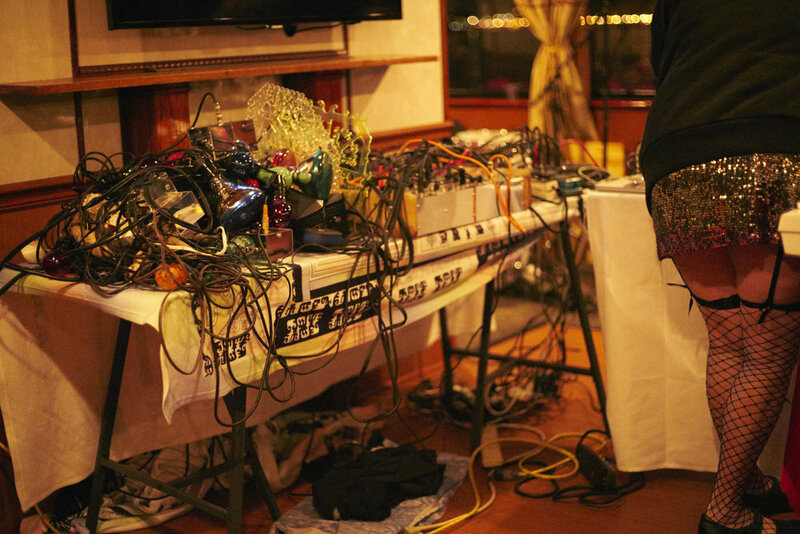 Voicehandler, the duo of Jacob Felix Heule and Danishta Rivero, is an electroacoustic ensemble combining improvisation with original compositions. In 2012 they received an Individual Artist Commission grant from the San Francisco Arts Commission to compose song cycle. They have performed at the Soundwave Festival in San Francisco, and the Roost Creative Soundscape Festival in Albuquerque, in addition to concerts in Southern California and the Bay Area. Kevin Blechdom, born Kristin Erickson, is an experimental electronic musician/performance artist from San Francisco, California. 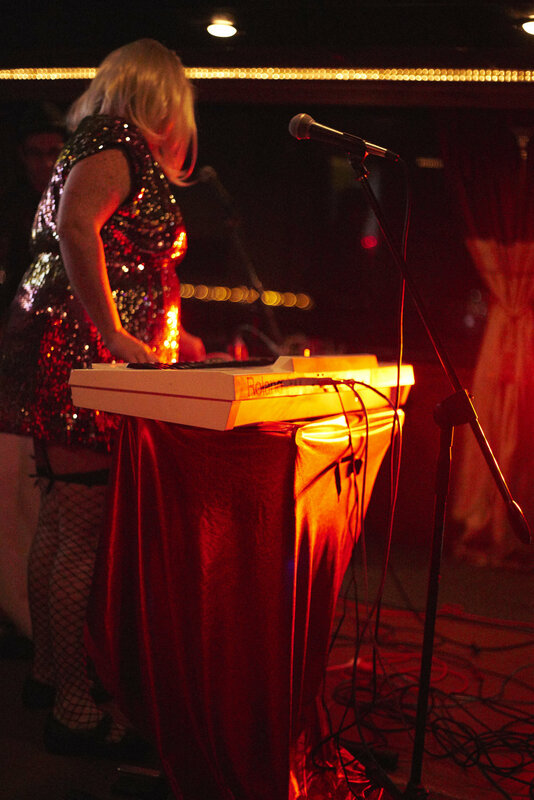 She attended Mills College in Oakland, California, where she founded Blectum from Blechdom with Blevin Blectum, an experimental electronic group. In 2001, Blectum From Blechdom won an Award of Distinction for digital music at the Prix Ars Electronica. 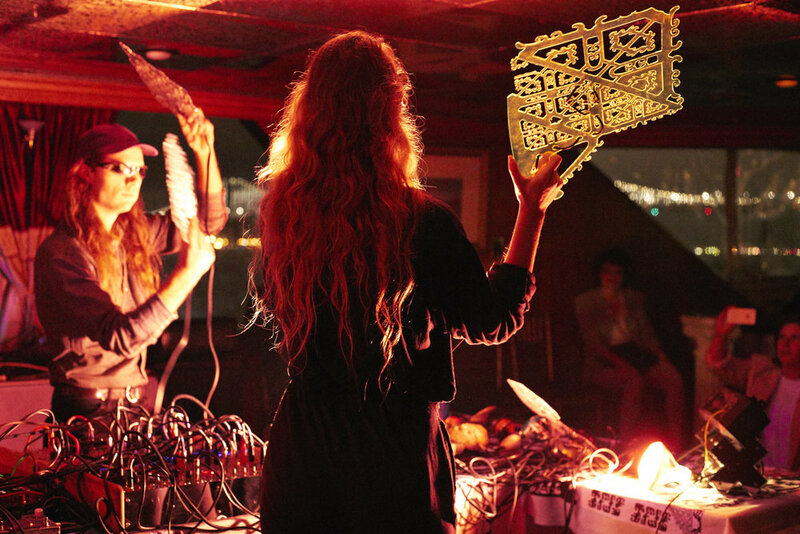 Las Sucias is a feminist noise reggaeton duo formed by Danishta Rivero and Alexandra Buschman, mixing anti-patriarchal riotgrrrl lyrics, afro-caribbean rhythms, brujería noise and possessed vocals. Each performance is a ritual that combines all of the senses and elevates into a higher realm, inspiring the listener to dance, speak in tongues, laugh hysterically and get possessed by the spirits awoken. MSHR is a collaborative project by Birch Cooper and Brenna Murphy based in Portland, Oregon. 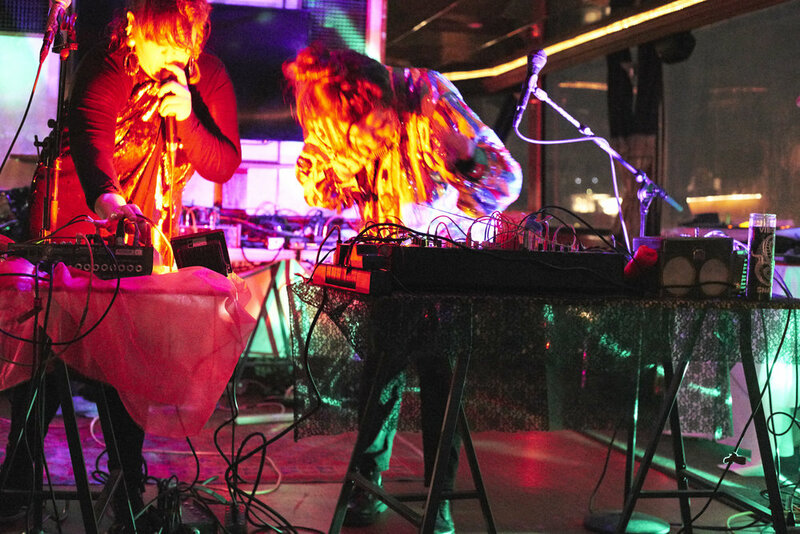 The duo produces sculptural synthesizers, ritualistic performances and installations that place the human body into a dynamic relationship with sound and light, generating expanded sensory experiences. International Freakout A Go-Go presents a Psychedelic Dance Party on the lower deck of the boat with live visuals by Flower Pattern (Adrian Saenz) and DJ sets by Bobby Ganush. Flower Pattern (Adrian Saenz) will conjure a mixture of psychedelic visuals and a live camcorder stream throughout the evening to accompany bass-heavy DJ sets of go-go sounds, synthesized Cumbia and sub-tropical bass selections by Bobby Ganush. Lead artist Constance Hockaday creates “outsider” maritime arts projects. 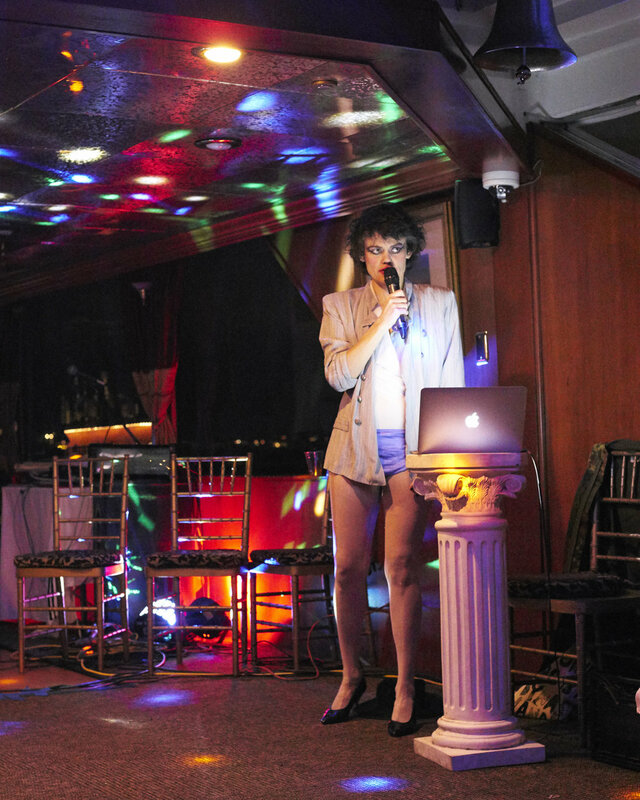 From a floating hotel to a floating peepshow, The New York Times described her most recent performance installation – All These Darlings and Now Us – as a powerful “commentary on the forces of technification and gentrification roiling San Francisco.” The project highlighted the displacement of San Francisco’s queer community: more than 1000 people watched peepshow performances on a raft of retrofitted sailboats featuring artists from two recently shuttered iconic queer businesses – The Lusty Lady and Esta Noche. Hockaday holds an MFA in Social Practice and a Masters in Conflict Resolution from Portland State University. She is a 2014 TED Fellow and has received grants from The Puffin Foundation, the City of Oakland, and the Fund for East Bay Artists and commissions from Southern Exposure, Mills College Art Museum, Parrish Art Museum, Flux Factory and the San Francisco MOMA. Hockaday was a 2016 Headlands Center for the Arts resident.